Don’t Tell The Bride is back for a brand new series next year and they’re looking for couples to be on the show. Yeah, brides, I know you don’t get any say over the wedding and the grooms have the tendency to act up, but you’re given a budget of £13,000 to make your big day. Viewers have seen some car-crash weddings through the 13 series, since it started back in 2007. There’ve been plenty of hilarious moments, including colossal break-downs over choice of wedding dress, venues and hen parties. We’ve even seen grooms make some pretty selfish decisions, including the time somebody blew their budget on inviting pigs to the wedding. Billy Grieves thought it’d be a great idea to spend £14,000 on bringing in 50 pigs to walk his fiance down the aisle and to give the bridesmaid pig onesies because bride’s nickname is ‘little piggy’.. err, not sure about this, Billy? 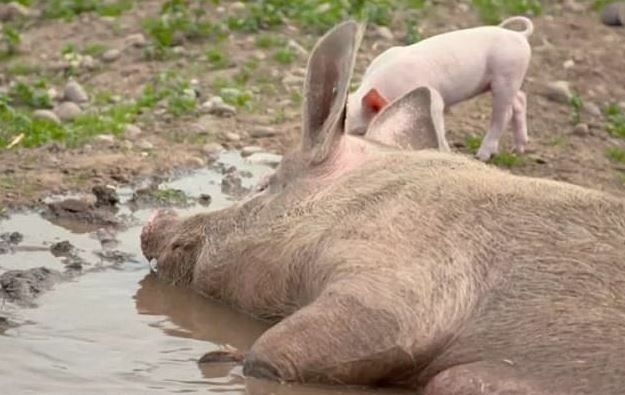 Billy, a self-confessed joker (he’s one of them), hired the 50 pigs in an attempt to break a world record pig parade – which failed spectacularly when the pigs decided they, as animals often do, were having none of it and going to do their own thing. Steph – who dreamed of a traditional wedding in the country, (so I’m not sure why she opted to go on Don’t Tell The Bride because that NEVER happens) – was not impressed. I’m so mad now, I don’t want to go to the wedding, I’m fuming. The mother of the bride was also pretty furious and she, along with Steph, were unable to crack a smile as they walked down the aisle. When your first daughter is getting married, this is not what I wanted. I’m not a world record holder but I married the girl of my dreams. Watching this week's Don't Tell the Bride. What sort of absolute asshat thinks a wedding on a pig farm attended by 50+ pigs is a good idea? Watching don't tell the bride again, a full wedding about pigs ? too far! This program gets me so up tight ? If you and your partner want to be considered for a show on the next series, all you have to do is complete the short questionnaire, fill in your details and add a recent, clear photo of you and your partner on the Renegade Pictures website.